Widget masks are used to customize the shapes of top-level widgets by restricting the available area for painting. On some window systems, setting certain window flags will cause the window decoration (title bar, window frame, buttons) to be disabled, allowing specially-shaped windows to be created. 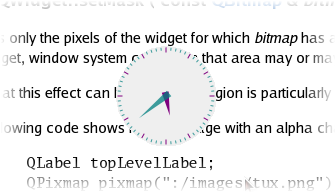 In this example, we use this feature to create a circular window containing an analog clock. Since this example's window does not provide a File menu or a close button, we provide a context menu with an Exit entry so that the example can be closed. Click the right mouse button over the window to open this menu. The paintEvent() implementation is the same as that found in the AnalogClock class. We implement sizeHint() so that we don't have to resize the widget explicitly. We also provide an event handler for resize events. This allows us to update the mask if the clock is resized. Since the window containing the clock widget will have no title bar, we provide implementations for mouseMoveEvent() and mousePressEvent() to allow the clock to be dragged around the screen. The dragPosition variable lets us keep track of where the user last clicked on the widget. setToolTip(tr("Drag the clock with the left mouse button.\n"
We inform the window manager that the widget is not to be decorated with a window frame by setting the Qt::FramelessWindowHint flag on the widget. As a result, we need to provide a way for the user to move the clock around the screen. If the left mouse button is pressed over the widget, we record the displacement in global (screen) coordinates between the top-left position of the widget's frame (even when hidden) and the point where the mouse click occurred. This displacement will be used if the user moves the mouse while holding down the left button. Since we acted on the event, we accept it by calling its accept() function. The mouseMoveEvent() handler is called if the mouse is moved over the widget. If the left button is held down while the mouse is moved, the top-left corner of the widget is moved to the point given by subtracting the dragPosition from the current cursor position in global coordinates. If we drag the widget, we also accept the event. The paintEvent() function is given for completeness. 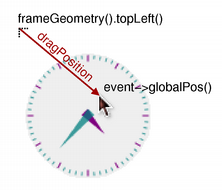 See the Analog Clock example for a description of the process used to render the clock. Since the clock face is a circle drawn in the center of the widget, this is the region we use as the mask. Although the lack of a window frame may make it difficult for the user to resize the widget on some platforms, it will not necessarily be impossible. The resizeEvent() function ensures that the widget mask will always be updated if the widget's dimensions change, and additionally ensures that it will be set up correctly when the widget is first displayed. Since QRegion allows arbitrarily complex regions to be created, widget masks can be made to suit the most unconventionally-shaped windows, and even allow widgets to be displayed with holes in them. Widget masks can also be constructed by using the contents of pixmap to define the opaque part of the widget. For a pixmap with an alpha channel, a suitable mask can be obtained with QPixmap::mask().